If your students have turned the last page in their book, they are bound to have a great sense of accomplishment. After all, learning a second language well enough to read fifty or more pages really is a big deal. But now what? 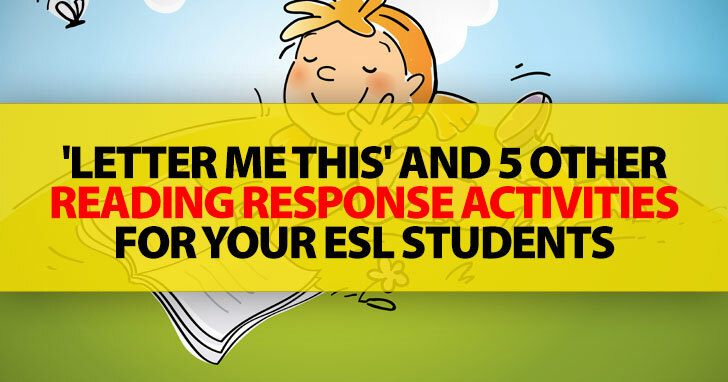 What should those same students do to respond to what they have written? Here are some ideas for reading responses to both fiction and nonfiction for your ESL students. Conflict is a fancy way of saying problem, and every piece of literature has one. After reading the book, have your students tell a partner about the conflict in the book in a partners discussion. Who was involved? What was the problem? What actions did the main character take to solve that problem? How was the problem eventually solved? If you want your students to put their conflict analysis in writing, try giving them three different colored sticky notes. On one, they should write a sentence or two about who was involved (characters). On the second, they should write what the conflict or problem was. On the third, they should write how that problem was solved (the resolution). If you like, have students fill a fourth sticky note with ideas on other ways the conflict could have been resolved. When children write their own fictional pieces, it often helps to point out that they will need a clear beginning, a middle, and an end. To help them understand this structure, try this response to literature. Have your students divide the piece they read into these three sections: beginning, middle, and end. Students should start by making three columns on a piece of paper and labeling them beginning, middle, and end. They should then fill out the chart with what they remember from the story. The beginning is the introduction and set up. In this column they should write the characters, what their life was like before, and what changed that caused the problem. The middle is what happened after the problem appeared. What did the characters do? What obstacles did they encounter on their journey? The end is the resolution and how it all played out by the last page or paragraph. What changed in the characters’ lives? How did they solve the problem? Did they learn anything? IF your class all read the same book, have them compare their notes with one or two other people to see if they can get all the important details the story had to offer. Then the next time you want them to write a fictional piece of their own, start with the same chart and have students take notes on what they plan on writing. One of the struggles ESL students often have is they understand and remember more of what they read than they are able to express with the language they can use. To sidestep this last hurdle, have students draw a picture of their favorite part of the reading or of an important part in the story. This will allow students who struggle with language production to express their thoughts without the pressure of grammatical perfection on their shoulders, and it will also give you an idea of how much they understood even if they can’t express their thoughts in words. If you like, follow up by having each student explain as much of his or her picture as he can. Did your students like the main character of the book? Did they dislike him or her? What about the secondary characters? Help your students get a little more personal with the characters in the book by asking them to write a letter to a fictional person of their choosing. In the letter, they should include some thoughts about what that character did in the book and whether or not they agree with the character’s actions. They should also include two or three questions they would like to ask the main character. If you really want to challenge your students, exchange letters and have each student pose as a character and answer their classmate’s letter. After reading a nonfiction text, an easy way for your students to respond is to list four or five facts that were in the passage. You can either have them do this from memory (to see how much they retained after reading) or with the text in front of them. If you prepared for the reading passage with a K/W/L chart, the facts will complete the last column of the table. Whether your students are reading a fictional piece or a nonfiction one, they will probably note any unfamiliar vocabulary as they read. To help them get the most out of what they are reading and improve their reading skills, challenge students NOT to use a dictionary as they read. Instead, have them circle or highlight the words they come across that they just don’t understand. After they complete the passage, have them make a vocabulary analysis chart. They should make four columns in their chart. In the first, they write an unfamiliar word they came across in the reading passage. In the second column, they should copy the sentence in which the word appears in the original text. In the third column, they should guess at the definition of the word based on the context. In the fourth column, students should use a dictionary to write the actual definition of the word. If you like, have students add a fifth column in which they write an original sentence that clearly shows the meaning of the word. If your students are reading a longer selection or a complete novel, you might want them to do this activity at the end of each chapter or section of the reading. Whether your students have read a fictional piece or completed a factual text, celebrate their great accomplishment. Then follow with a response to reading that helps solidify in students’ minds what they have read. What are some of your favorite responses to reading?